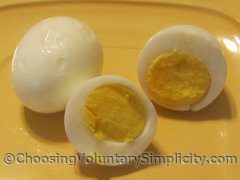 What Is The Best Way To Cook a Perfect Easy Peel Hard Boiled Egg? 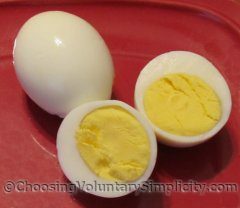 Home » How To's & General Information » What Is The Best Way To Cook a Perfect Easy Peel Hard Boiled Egg? 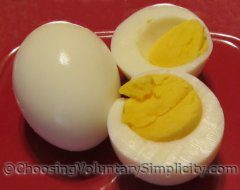 What is the best way to cook a perfect hard boiled egg? I would guess almost everyone thinks their favorite method is the best one. 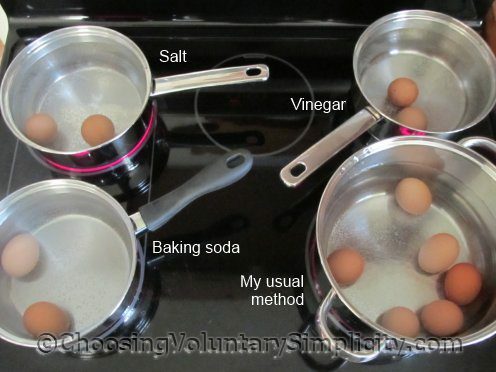 I’m guilty as charged… I always cook eggs using the same method… and for me, this method is foolproof. The eggs peel easily every time and they’re always the degree of doneness we like with no green ring around the yolk. I have to admit, I hadn’t tried any of the other recommended methods, not recently anyway… until a couple of days ago when I needed eggs for a salad. I guess I was in the mood for experimenting. I cooked fourteen eggs. All the eggs were large, brown and organic and were purchased about a week ago. All the eggs came directly from the refrigerator and were started in cold water (enough to cover the eggs by about two inches). All the eggs were brought to a boil using high heat… then each pan was removed from the heat and covered tightly. At the end of fifteen minutes all the eggs were cooled with three changes of cold water. I left all the eggs in the cold water for fifteen minutes before peeling. None of the eggs cracked during cooking. With vingear added… The recommendation seems to be for one tablespoon of vinegar (more or less, depending on the size of the pan). The vinegar supposedly helps in the peeling and keeps the egg white from running out of any eggs that crack. 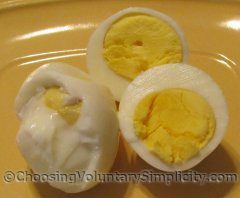 The vinegar doesn’t affect the flavor of the egg. I added one tablepoon of vinegar to the water for these two eggs. I had a great deal of trouble peeling these eggs, and the white was so stuck to the shell that both eggs ended up with large potions of missing white. With salt added… The recommendations range from a pinch of salt to one teaspoon to one tablespoon… dependent I would guess on the size of the pan. The salt supposedly prevents cracking and firms up the proteins in the egg, making it easier to peel. I added one teaspoon of salt… these two eggs were second hardest to peel, and they also ended up with several small areas of missing white. With baking soda added… The recommendations range from a half teaspoon to a teaspoon of baking soda. Supposedly the baking soda changes the pH and separates the white from the shell. 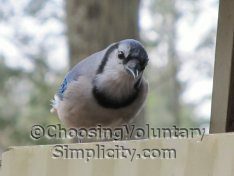 Others dispute this theory and the science behind it. I added one teaspoon of baking soda but wouldn’t do it again. These eggs were not easy to peel… but I did manage to peel them fairly cleanly. My method… I cooked six eggs using my usual method. Nothing was added to the water. All six eggs were easy to peel with the shells slipping off in large portions. 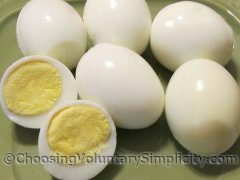 I did notice that the yolks of all six eggs were a lighter yellow than any of the eggs cooked using the other methods. I wonder if it’s fair to conclude that the salt, vinegar, and baking soda changed the yolk color of the other eggs.